Bishop Hannington Memorial Church is dedicated to the memory of James Hannington, the first Bishop of East Equatorial Africa. James Hannington was born in Hurstpierpoint, a few miles north of Hove, on September 3rd 1847. His father had his own counting house in Brighton, and was part of the family that owned Hannington’s department stores which closed a few years ago. James was an avid collector as a boy. After school he naturally joined his father’s business. In 1867 the chapel which his father had built in the grounds of his property was licensed for Anglican services. 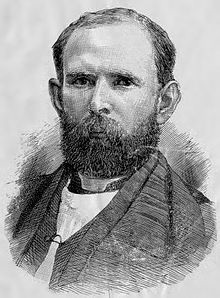 James’ attendance there led him to move towards ordination, and in 1868 he entered St. Mary’s Hall, Oxford, and was ordained on March 1st 1874. At this point James was ‘not right with God’, and it was not until he read the book ‘Grace and Truth’ by Dr. Mackay some months later that he realised that his sins were forgiven. “My eyes were opened” he wrote. In 1875 James became curate-in-charge at St. George’s, Hurstpierpoint where he stayed until 1882 when he volunteered for service in Uganda with the Church Missionary Society. He had by then been married for five years. He left England in May 1882 and arrived in Africa on June 29th. The next year was one long trek into the heart of Africa during which James suffered recurring fevers from which he was never to completely recover. He returned to England in 1883 to be told that he must never again visit Africa, but by April 1884 his specialist told him that he was well enough to return. On June 24th he was consecrated Bishop of Eastern Equatorial Africa and returned. His last expedition was into Masai territory with a group of about 200 porters, and William Jones, a native clergyman who Bishop Hannington had recently ordained. The journey of his ‘army of peace’ left base on July 23rd but on October 12th James left the main party with 50 picked men to visit missionaries in Uganda. On the 21st his party was ambushed. After exhibiting him as a trophy for a week, his tormentors speared him to death on the 29th. We know most of this detail because one of the Ugandans kept Hannington’s journal and sold it to a later expedition. His last recorded words were “go tell your master that I have purchased the road to Uganda with my blood”, he was 38 years old.